Fugly Horse of the Day: Guess the Age! 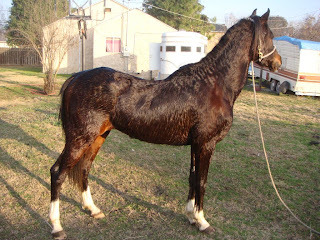 This is a "full blooded" Arabian stallion for sale for the low, low price of $3,200. I think they may throw that classy halter and lead in with him if you ask nicely. And hey! They already gave him a bath! How old do YOU think he is? Let's take guesses...extra credit for counting off all of the conformation faults of which there are many. All I can say is Gelding AMBULANCE for this one! I know I'm late today but we do have a Friday Featured Rescue! This one is in San Martin, California and he'd love a new home for the new year. 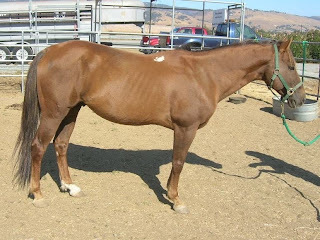 "“Pirate” is a Quarter Horse mix, 14h, 14 years old. He is very gentle and easy to handle. We haven’t tried to ride him, but he has massive scars on his withers from an ill-fitting saddle so clearly he was ridden extensively at some time in his life. He has an unusual brand that we couldn’t trace, but one of our ACOs who is a cattle person said it’s a common type of brand that working ranches use to identify their young stock, so this guy probably was used to work cattle. When he came in, he had a tumor in his eye requiring surgery. Local horse people donated over $1000 and thanks to them, he had his eye removed, teeth floated, and vaccinations/deworming done. He was in foster while recovering from surgery and the foster Dad often led him around with his young daughter on his back. Unfortunately, while in the foster home Pirate started cribbing, a behavior we hadn’t seen before. He is currently at the Santa Clara County Animal Shelter in San Martin. Hours, directions etc. are on our web site www.southcountypets.com." Breeding farm or concentration camp? Really amusing uses of photoshop! But he goes back to the Darley Arabian! A challenge for my readers! You'll never longe horses in this town again! Trying to get the word out! And this one doesn't have any calories! One of those update posts! Back on the Chain Gang! Are there horses we truly cannot help? Soundness: Tell us your success stories! Back in business, yet again! $150 for a bullet, and other CBER fairy tales!